This book is fanfiction. I don’t say that disparagingly — I’m very positive on fanfiction, as is natural, since I’ve been writing it for fifteen years myself — but that is, absolutely, what it is. It’s not a re-imagining, it’s not “inspired by” — it is fanfiction of Pride and Prejudice. What’s more, it appears to be fanfiction derived more from the 1995 BBC miniseries than from the book itself. Whole chunks of the book read like a narrative of the film, with little augmentation on Aidan’s part. 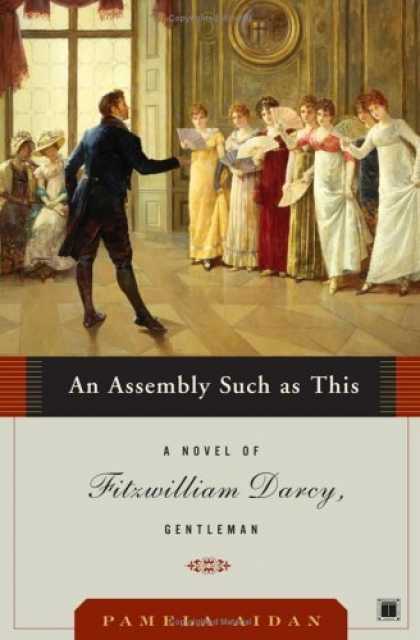 An Assembly Such as This is the first in a trilogy of books written from Mr. Darcy’s perspective, and it begins just where the film does — with Darcy arriving with his friend Mr. Bingley at Netherfield. From there, we roll through the events of the first third or so of Pride and Prejudice — the country gatherings, Jane Bennett falling ill at Netherfield, the promised ball, etc — getting Darcy’s view on matters rather than Elizabeth’s. There is some interest to this — we get a bit more insight into both the Bingleys and the Darcys as families and about the connections that bind them. We see more of Caroline Bingley’s machinations, and learn more about Georgiana’s troubles. But the main point of switching the perspective — getting more of Darcy’s internal monologues — could use better execution. We do get to see him grapple with his feelings for Elizabeth, but there’s not a lot of depth to his self-analysis. The best word for it is probably “aimless”. Or perhaps “bland” — Aidan doesn’t really fill Darcy in as an exciting, attractive character. He seems rather normal and pedestrian — it’s hard to see from her augmentation precisely what there is to fall madly in love with. My ultimate verdict is: Inoffensive if uninspiring. If Jane Austen fanfiction fluff is what you’re after — and I say that with no judgment, because sometimes fluff is absolutely what you want to reach for — then this is the book for you. If you want something rather more inventive, well, there are plenty of romance novel authors out there happy to oblige you.